An unusual knitwear label, Carded and Combed centres on a code of ethics that guarantees their pieces are ethically and sustainably made. Avoiding the compromises that others in the industry make, this Australian label produces incredibly soft, high quality knits. Poepke spoke to Sarah Perry, the creator of Carded and Combed, about their code of ethics and the pieces that are in store. Where does the name for your knitwear line come from? It’s a technical description. The name focuses on the fibre and processes involved in creating the range. 15.9 is a fibre micron measurement (which is superfine). Carding and Combing is the refining technique used to create the yarns that I use in my knitwear line. What is non-mulesed wool, and why is this important? I choose to source raw-wool from growers that are certified non-mulesed. Mulesing is when a lamb, up until the age of one year, has the skin removed from under its tail. This is painful for the lambs and often results in death. It was introduced in the 1920s in Australia to reduce the effect of fly strike. For me it’s an ethical choice, as the non-mulsed Merino sheep have a better quality of life. Ethical sourcing and production is central to this collection. Could you unpack exactly what that means for us as buyers? It’s about giving people choice. By keeping production transparent, buyers know where their garments are coming from and how they are produced. Has it been difficult to find people to work with who also operate from an ethical mindset, or do you think this is changing? There are a lot of supporters for humanely produced wool and ethical manufacturing in Australia. I think education and awareness is instrumental in change. There is such attention to detail in each piece. Could you run us through your production process? 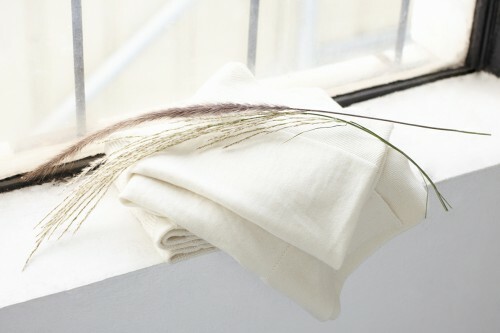 I select the raw wool fibre, process the yarns and then further develop the garments. Each item has a unique feel, they are not mass produced and are made by artisan knitters in both Sydney and Melbourne. Each neckline is hand linked and some garments are hand dyed at the Waterloo studio. Could you give us a quick guide to the styles that we have in store at Poepke? The women’s crew neck sweaters are a relaxed slim-fit shape. The detail is in the neckline. The men’s fine cable knit is a classic men’s style, worn next to skin or as a secondary layer. The signature natural cream colourway showcases the yarn in its purest form, whilst the hand dyed colour palette is unique to Carded and and is developed in-house.